Ministry of Propaganda - 22/May/2004: "WalkIslay Travelogue Complete"
Time for yet another shameless plug: It's done, the Islay Walking Week 2004 travelogue is complete, this evening I finished the last page with pictures from the drive back to Swindon with the visit to Crarae Garden. I hope that you like it and that it might even inspire some of you to a visit to Islay. If you participated in the walking week and read this (I think some might know of this weblog), I hope I can bring back some nice memories. If you are an Ileach thank you for your hospitality (and if you find any mistakes please let me know, so that I can fix them). And finally a thank you to the WalkIslay organisers and guides! Ian Brooke of Kilchoman House Cottages first of all. Then DJ, Carl, Bryony, Mike, Jack, James and Gus. Everyone at the Ionad Chaluim Chille Ile (The Columba Centre). And anyone I missed due to my appalling memory for names. 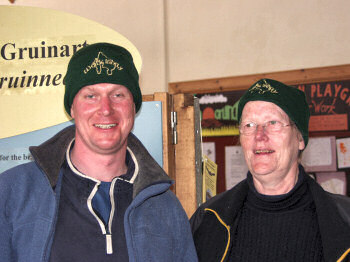 My mother and me with our WalkIslay hats. For obvious reasons.